My Top 13 Best Above Ground Swimming Pools for Cheap to Buy! What are the Best Above Ground Swimming Pools for Cheap to Buy? Summer is finally on its way! I heard you are looking for a nice swimming pool above ground for cheap? I just found some amazing and refreshing cheap above ground swimming pools online and I am very excited to show them to you! A nice and very large above ground swimming pool for the backyard! The biggest advantage of a nice swimming pool above ground in my opinion is that you can take it with you when you move! If you have kids and you live in a house, chances are they want a swimming pool! When I was a kid we always had a cheap pool in our backyard and my sisters and I always had a blast! Kids love to play in the water! Nowadays there are so many options, sizes, shapes and prices that I believe anyone can have a pool in their backyard! Above ground pools are the cheapest kind of swimming pools for sale and the easiest to set up and start splashing in the water right away! But which ones are the best for your home? First of all, how much space do you have in your backyard? Second, how much can you afford? These backyard pools come in many sizes! I prefer the large ones, that will fit the entire family! On this page you are going to find the best above ground swimming pools for sale online based on their popularity, price and size! I am going to start with the larger ones, (I really like all the Intex swimming pools for sale… they are among the best of the best! ), followed by the medium-sized ones and at the end you will find the best inflatable pools for the small kids and toddlers! They LOVE splashing around too! Are you ready to get your pool? I am excited to be part of it! 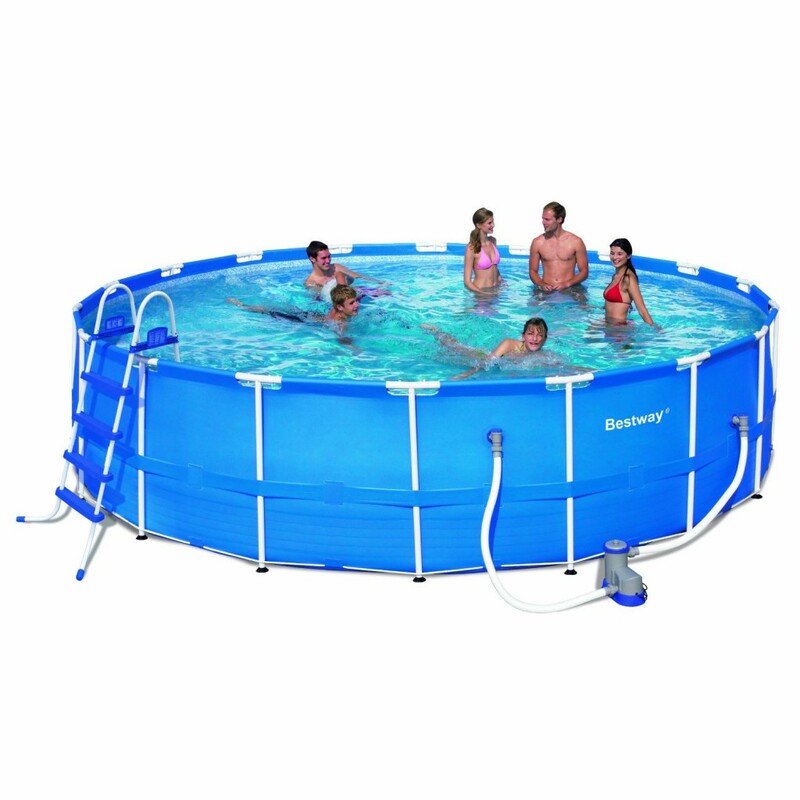 This round above ground pool package for sale comes in six different sizes, the first is the 18 feet by 52 inch. As you can see it fits the whole family and it looks gorgeous! It comes with a very nice and strong ladder, the pump and the motor. The installation video will show you how to set up this pool step by step. But the wait will be worth it! This is a sturdy and very well-made above ground pool! Some buyers recommend you get a lot of sand or a pool pad to place under the pool, for extra-safety and to help prevent the liner from tearing. I think it’s worth all the trouble setting it up! *This guy shows us exactly what to expect when installing your new above ground swimming pool! Best Above Ground Large Swimming Pools to Buy! This oval metal wall above ground swimming pool comes in 7 different (large) sizes ranging from 18 feet to 41 feet and 48 to 52 inches deep. As you can see it will also fit everyone! The pump, ladder, skimmer and filter are also included in this package! Large above ground pools are also perfect for using a nice pool float and just relax! This pool also has one of the best galvanization coating around, which prevents corrosion. Again, setting it up will take approximately the whole day and a few men. Spring is the right time to buy these above ground pools, you can take your time setting it up and when summer starts it will be all ready to use! Best Intex Above Ground Swimming Pools to Buy! Intex is one of the most popular above ground pool brands around and they are usually far less expensive than other brands. This is one of my favorite large Intex rectangular pools for sale! I love the size, looks and design! First thing you will need to do before you start setting up is to find a very flat surface! This pool is also very easy to keep and to clean! *Look how gorgeous this pool looks after it is set up! Best Above Ground Swimming Pools for Cheap! If you are looking for the best cheap above ground pools, for under 1,000 dollars, then you are going to LOVE this Intex rectangular swimming pool for sale! First of all it is absolutely perfect for a small size backyard! Set up is extremely easy! It will take you less than two hours! It will take approximately nine hours to fill it up with water. Even though this is a cheaper Intex pool, the metal frame is very strong, the lining is nice and thick and the size is pretty decent as well! Overall this is a great affordable pool for your backyard! *Great helpful video on how to set up your new Intex rectangular frame pool! One of The Cheapest Intex Above Ground Pools Under 500 Dollars! This is one of the cheapest high-quality Intex metal frame round above ground swimming pools for sale! It is under 500 dollars! It is also super easy to assemble and fill with water! It comes pretty much with everything needed, including the pump and ladder! It will hold approximately 4500 gallons of water! Perfect to throw fun summer pool parties for the kids! It fits up to 8 people inside comfortably! If you are on a budget but would love to buy a pool for your kids this summer, this is it! *This guy set up his new Intex pool all by himself! Cheapest Intex Pools for Sale Online! Another fun and extremely easy to set-up family swimming pool above ground for cheap! Set-up will take about 15 minutes! What better way to keep cool during summer time than splashing around in this awesome above ground pool? Happy buyers say this is a fantastic recreational pool! My Favorite Cheap Swimming Pools for Sale! This is also a very popular and one of the most bought cheap Intex above ground oval pools for the backyard! It costs less than a laptop computer! It holds over 2,800 gallons of water and it fits the whole family! This pool is also perfect for smaller backyards! It’s deep enough for you to exercise and also to put a float! Great for children ages 6 to to 10 years old! The size is perfect for them! Not too shallow, not too deep. That’s not to say mom and dad cannot enjoy this pool…. It’s also fun for adults as well! Buyers are very happy with this pool and they say it lasts for many years! Another popular and very affordable large round Intex easy set above ground pool set! This pool is perfect for smaller children and small backyards! My sister used to have this awesome round pool in her backyard and the whole family got to enjoy! You won’t believe how easy and fast it is to assemble! It’s about 4 feet deep and it’s just perfect to enjoy in a hot summer day! The same way it’s easy to set it up it’s also easy to dismantle when winter time comes. All you really need is a nice flat ground surface! *This lady is showing her Intex pool all set up! Intex 12-Foot by 30-Inch Round Metal Frame Pool Set for Sale! One of the Cheapest Intex Swimming Pools Above Ground! This is a very nice and very cheap 12-Foot by 30-Inch size above ground ground Intex pool with metal frames! Very easy to set-up, no tools needed! Set-up will take less than 45 minutes! As you can see it will fit the whole family! So take your time choosing the perfect spot! It fits around 6 kids inside comfortably (or 3 adults) and it holds about 1,700 gallons of water. *This is the smallest and cheapest size, but you can also choose among 3 other bigger sizes. They are all very affordable in my opinion. HUGE Round Above Ground Swimming Pool for Cheap! This is a strong and very large (18-Feet by 48-Inch) complete family pool above ground! Perfect for a large backyard! Great for a summer party or a family get together! Buyers said this is one of the best backyard pools for the money! It comes with everything you’ll need to install and care for the pool. I had to show you this fantastic above ground exercise swimming pool for sale! Just imagine yourself ‘suspended’ by a waist band and ready to start lap swimming! How long can you go before you get tired? This is a very compact lap pool that you can place basically anywhere you want! It holds 1,500 gallons of water and it is 10 x 6.5 feet. It is not difficult to set it up, but of course you need to make sure you have a very nice FLAT area. Most buyers are extremely pleased with this exercise swimming pool! Needless to say swimming is one of the best exercises for everyone! *Check it out how awesome this pool is! Fun Inflatable Family Paddling Pool / Baby Pool with Backrest! Now if you’ve got toddlers and want to find the perfect kiddie pool to have fun with them during summer, then you are going to love this fun inflatable kiddie pool with backrest! Mom and dad can enjoy a nice and hot summer day comfortably inside this awesome toddler pool while their little ones have a blast splashing around! *I hope you had a nice time here today choosing the best above ground pool for your family!